Deadline [Audiobook Review] – my books. my life. This is the second book in the Newsflesh Trilogy. Please don’t read this review if you haven’t read Feed (actually you should go read it now and then come back because it’s SO GOOD). There are spoilers in the first book that would really ruin that experience for you. 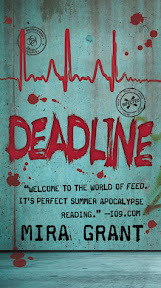 If you’ve read Feed, proceed. If not, you have been warned. Buffy is dead. Georgia is dead. Rick is in the White House. Shaun is left to manage After the End Times on his own. When Kelly, a CDC researcher who everyone believes is dead shows up with some disturbing information about Kellis-Amberley, the new gang once again gets caught up in their search for the truth. I wasn’t sure what to think going into Deadline. I knew it would be a different experience from Feed, which I adored. Shaun narrates this one and the book shifts to new main characters (by necessity). But I was not disappointed. This felt very much like a middle-of-a-trilogy book to me. It moves along nicely but is clearly setting up the final book. For that reason, we don’t get all the answers and we are left quite the cliffhanger (I NEED the next book NOW). Yet there was enough action happening throughout to keep me satisfied. Similarly, we learn more about the Newsflesh world and the way Kellis-Amberley has evolved, which is all very detailed and super interesting. One of the things I loved the most in Feed was the politics. While Deadline doesn’t have an ongoing political campaign, there is plenty of bureaucracy, conspiracy, and power struggling to keep us sated (the CDC is EVIL, guys). I am glad that Shaun is crazy and sees and hears Georgia because I would have missed her if she had been totally absent. It also made being inside Shaun’s head a little more interesting. The narrators are different in this audiobook which made me a little sad because they were very good in Feed. But I can’t really fault either narrator in Deadline for anything other than being in the unfortunate position of following Paula Christensen. I highly recommend that audiobooks if you are interested in this series (which you should be because it is pretty awesome). I am certain that is how I will read the final book (which really can’t be soon enough). Ok, I skipped this review as advised, and think that I really need to read Feed. I am really interested in getting my toe into zombie books for some strange reason, and just recently bought The Reapers are the Angels at the Borders closeout sale. I bet that these two would be fantastic as well. I’ve been hearing about the audio version of Feed FOREVER. The last time I looked, my library didn’t have it, but now that I can get Overdrive, I’m going to look again. Or maybe…I should just wait until all three are out so I don’t drive myself crazy! Pingback: Blackout [Book Review] | my books. my life.